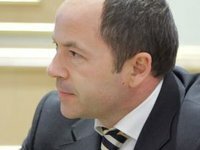 The Ukrainian authorities should offer people in the southeast such conditions, which will make them forget about secession, Ukrainian presidential candidate Serhiy Tigipko said. "The position of secession advocates is not strong. This [secession] may happen without difficulty only it is gains support of entire Ukraine but I am confident this will not happen. Personally, I will resist. I think we should fight for Donetsk and Luhansk," Tigipko said on Monday in the program Shuster Live. The politician said that concerns of people in the southeast - power decentralization, broader powers of regions, governor elections and broader use of the Russian language - should be resolved. "If we solve the problem of powers and rid of the situation in which every minor decision requires consent of Kyiv, it will be the right decisions to make," Tigipko said. In his opinion, the hypothetical secession of Donbas from Ukraine is a huge risk fraught with negative consequences. "The losses may be huge, both intellectually, seven million people, and economically, 30% of GDP and 25% of exports, and historically, this is our land. And I am confident their life will be much more comfortable within Ukraine if we deal with their concerns," he stated.